Update 8/13: More buffalo pictures, sent by a reader. This is what you get when you have a powerful camera and talent at photography! 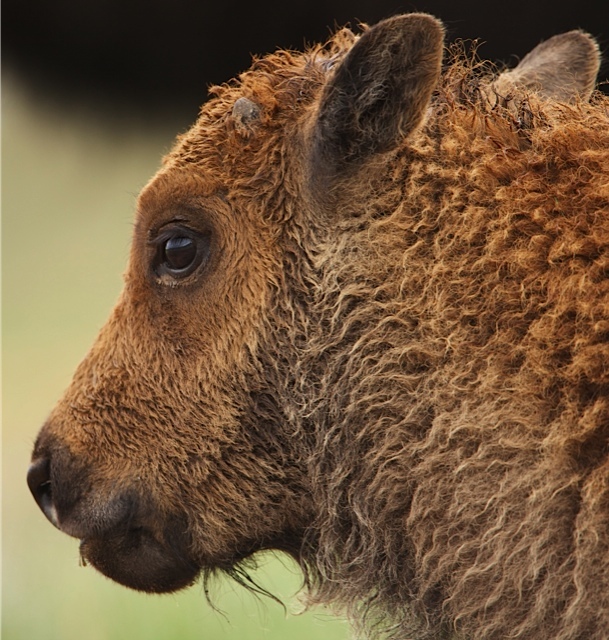 These are calves in Custer State Park and/or Yellowstone. I'm finally back from a long road trip through 8 states--Texas, Oklahoma, Kansas, Nebraska, South Dakota, Wyoming, and Colorado. 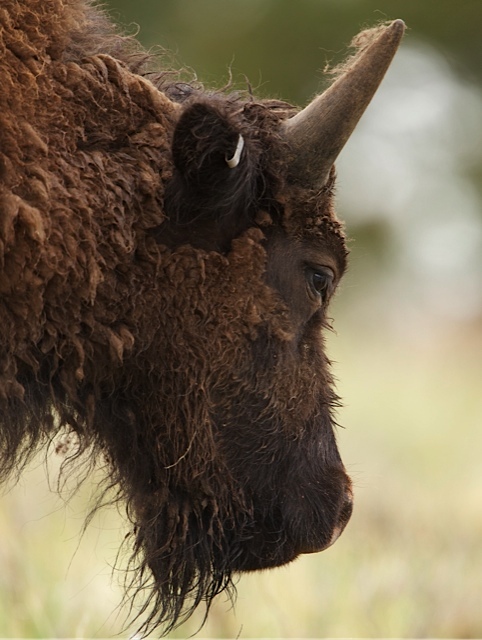 Starting at Badlands National Park in South Dakota, we started to get pretty obsessed with buffalo. You can find yourself in the middle of a large herd, as you drive along the main ridge. Later on in Yellowstone National Park, my daughter and I took a wonderful hike along buffalo trails. With a few in the distance (we'd figured out by that point it wasn't smart to get too close), we walked along their dust-bathing spots, through their mud/crap, and even beside their bones. Buffalophilia is much in evidence, all over the plains states. For example, the "buffs" are the football team at Western Texas A&M. "Buffs" even worship Jesus Christ! A fascinating and puzzling thing is that all this buffalo-love doesn't preclude killing Here's a stuffed buffalo at the highly perplexing "Wall Drugs" tourist attraction in Wall, South Dakota. The three categories (loved, hated, eaten) are not separate, except at the extremes. We've come to love dogs and cats as family members, so don't eat them. But there's love for buffalo too--or perhaps awe, respect, reverence, admiration. Those more distant, less cuddly, emotions seem to be combinable with killing and eating, for many people. There are both religious and naturalistic ways for people to think about this: God made buffalo for us to use and eat. Or: it's the way of nature for life to come from death -- we would be showing contempt for animals if we refused to participate. Something like that. Now that we are home, I have my very own buffalo who's going to buffalo me into getting a lot done before the semester begins at the end of the month. This is Flo (yes, a boy named "Flo"). And let's not fail to savor the fact that "buffalo" can be used 8 times in a row in a meaningful, grammatical English sentence.